← Joe Btfsplk: Oh Vowels, Where Art Thou? Today’s post is one of those that started in the “drafts” folder with exclamation marks and attempts at sentences and not much else. But this wasn’t writers block, kittens. Oh, no. Blame for the lack of my usual loquaciousness belongs squarely at the feet of the subject of today’s post, one of the few gentlemen in my life who can make me get all, like, non-verbal and stuff. 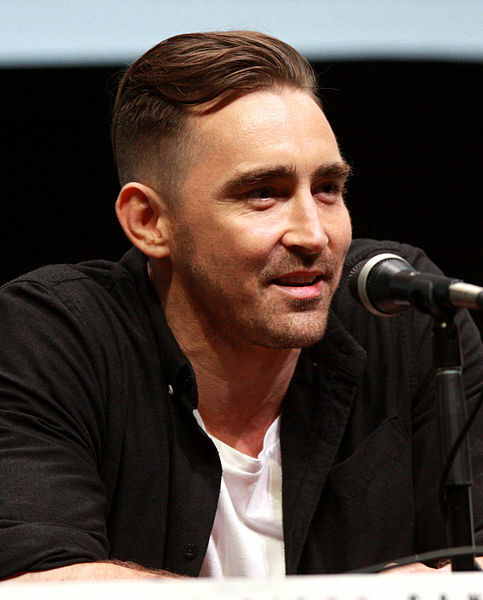 Everyone, say hello to Lee Grinner Pace. If you’d rather skip reading the rest of this post and stare at those mesmerizing eye-crinkles instead, I understand. Lee and I were destined to be together – here at The Blog of Funny Names, I mean – since the momentous occasion of his birth in the town of Chickasha, Oklahoma. A fellow drama geek, Lee temporarily dropped out of high school to join a theatre company, but returned to complete his degree and get accepted to the acting department of a little institution called The Julliard School. As if my little theatre-loving soul wasn’t his already, Lee cemented his status as one of the most important men in my life – here at The Blog of Funny Names, I mean – by earning nominations for not one, but two, Lucille Lortel Awards for his work off-Broadway. Lee’s film work is as varied as my taste in men, and he’s had roles in everything from the “Twilight” franchise to “Miss Pettigrew Lives for a Day”, but I love him the most for what he did for me in my living room. But I saved the best thing about “Pushing Daisies” for last. The three most important people in Ned’s life are named: Charlotte “Chuck” Charles, Emerson Cod, and Olive Snook. And they are in Every. Single. Episode. This entry was posted in funny names in movies, funny names in tv and tagged amb being a geek, amb's imaginary boyfriends, Kristin Chenoweth, Lee Pace, musical theatre, Pushing Daisies, tv shows that should never have been cancelled. Bookmark the permalink. while i have never seen this show, i easily see how it would all be worthwhile just to see the eye crinkles and friends with stunning names. Right ?!? There’s just so much to LOVE about this show !!! Eye crinkles…. is this really a thing?!? I also have never heard of this man, who is easy on the eyes. Who can blame you for appreciating his name? I want to call him Lee Inner Peace. If you’ve never died, is he allowed to touch you repeatedly? Uhuh. His name, that’s what I am appreciating right now. Yup. I love how you understand me, Kerbey. If you’ve never died I believe you’re safe. So we could totally, like, hold hands and stuff. I’m with you–it turns my brain into exclamation marks. I know. I’m getting no work done today whatsoever, and I’m totally fine with that. Ooh, I know this one! ME! ME!! HE CAN TOUCH MEEEE !!! I only watched a few episodes of Pushing Daisies but I’d like to get more into it! P.S. I never knew eye-crinkles was a thing that women cared about. Good to know! PS They are totally a thing. I have not. Which would you recommend first: Pushing Daisies or Wonderfalls? first the hoodie zipping thing and now the eye crinkles. Dave, Dave, Dave. So much to learn! And I don’t think they’ll cover this in med school. Amb’s pretty busy right now, but maybe if you ask her really sweetly she’ll teach you a bit more about what girls like? LOVED Pushing Daisies. Even have it on DVD. Can’t believe that’s the same guy! Wasn’t it just the best?!? I miss it all the time. Meanwhile, our boy Ned is going to be playing Ronan the Accuser in the next Avengers movie! That must be Nicholas Cage’s boy! I shoulda known you’d have an answer ready for that one. I’ve heard rumors that it’s going to be made into a musical … I NEED this to happen. Like, yesterday.